InFocus takes the prize for 'heaviest contender' in this group, as its IN2104 tips the scales at 3.1kg. Its slabby looks add to the impression of a bulky projector, despite it having the same dimensions as the Acer, Epson and Viewsonic models. To make matters worse, the power cord sticks out of the left-hand side of the unit, which adds to the footprint of the IN2104, as the rest of the cables attach at the rear. 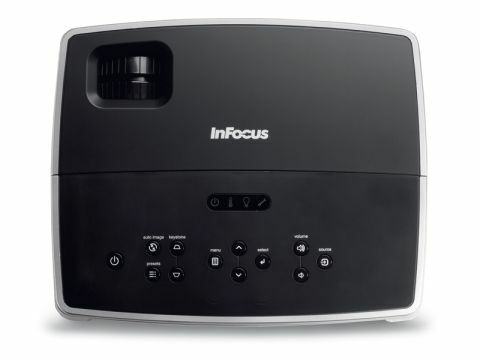 There's plenty of space on the back and InFocus has taken the opportunity to add plenty of ports and connectors. There are S-Video and Composite outputs (but no cables), three mini jacks for audio input and output, dual VGA inputs, a VGA output, USB and a Serial port. You also get a 5V power point for a LiteShow II Wireless adapter so you can control the projector from your laptop without hooking up a cable, but you'll pay £100 for the privilege. When you set up the IN2104, you'll ﬁnd the zoom range is so poor you'll very likely move either the projector or the screen to change the size of the projected image. The 35dB noise rating is unpleasantly loud and the cooling system makes a whining noise that adds to the noise pollution. Changing from Normal to Eco mode drops the noise level by 3dB, which makes very little difference, although it increases the bulb life from 2000 to 3000 hours. Making the Eco change introduces you to the remote control and the set-up menu, which is awkward to use as it only shows six items on each screen. This wouldn't necessarily be a problem, but one of the sub-menus has 24 items, so it can be quite laborious to make adjustments. It came as a pleasant surprise to ﬁnd the picture is bright, sharp, clear and pleasant on the eye, but getting to this point is too little too late. We've given the price as £433, but at the time of writing LambdaTek is selling the InFocus for £369, which makes the IN2104 slightly more tempting but it's not enough to overcome the downsides of this model.